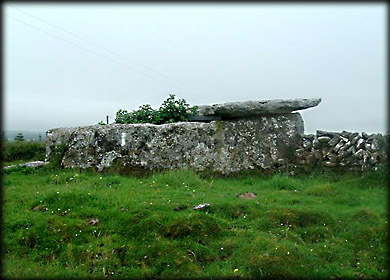 Ballyganner has a number of wedge tombs situated both in the northern and southern regions. 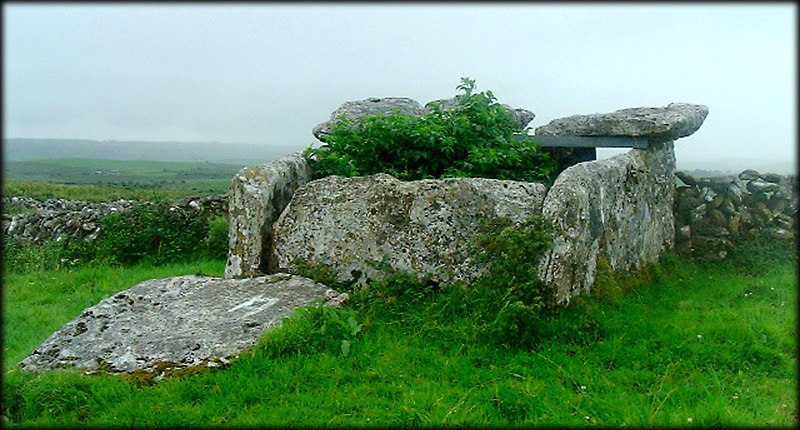 This one in the south is probably the biggest Burren type wedge tomb I have ever seen. The tomb sits on a small hill with a field wall extending out from the sides. It is at least 5.5 metres in length by 3 metres at the west tapering to 2.4 at the east end. It is also 2.4metres high at the western end. The huge roof-slab has broken in four parts. I stood in awe looking at the sheer size of this wedge tomb. Well worth a visit. Situated: From Kilfenora head east on the R476 for 4 kilometres. Then turn left and drive up for 1 kilometre. the tomb is just off the road on the left. Discovery Map 51: R2203 9445. Last Visited Aug 2002.